I have previously shared two stories about the increased jaguar (Panthera onca) poaching that is occurring in Bolivia as a result of the demand for jaguar parts in China. The most recent of these articles, released in February of 2016, claimed that one man was arrested before shipping 105 jaguar teeth to China – the equivalent of 26 dead jaguars. A new story from Mongabay suggests that the problem has not subsided. As I have written many times before, certain wild animal parts are believed to have special properties in traditional Asian medicine (TAM). Tiger parts, for example, are supposed to be able to cure a wide range of ailments and bolster men’s sexual potency. In fact, the TAM trade is one of the major factors that has driven tigers (Panthera tigris) to near-extinction. As tigers have become harder to find, other big cat species have come to be substitutes for their larger cousin. This includes jaguars. The problem is likely made worse in Bolivia due to increased Chinese involvement. According to Mongabay’s article, Chinese citizens have been enticing local people to kill jaguars and sell them the fangs – for exorbitantly high prices. Bolivian authorities have also been intercepting shipments of jaguar fangs headed for China. Between 2013 and 2016, they confiscated 380 jaguar fangs. This corresponds to at least 95 illegally killed jaguars. 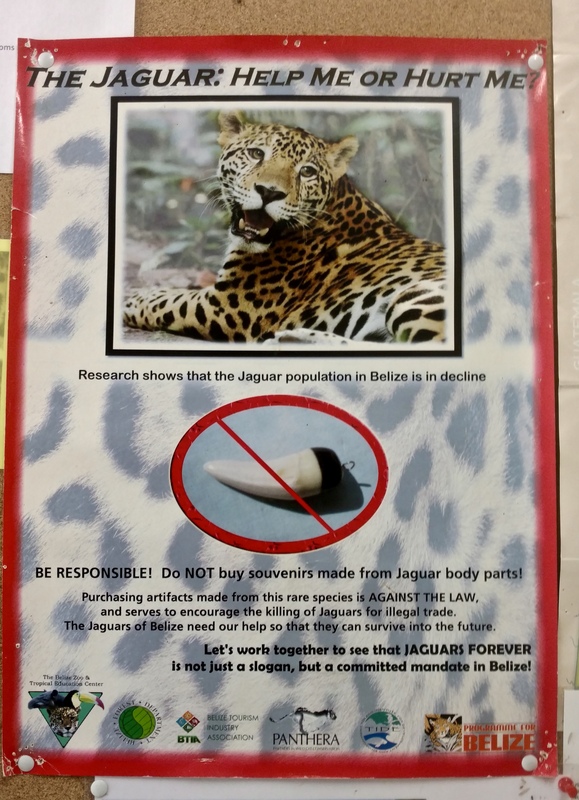 This sign I saw at the Belize Zoo could apply to other jaguar range countries as well. One of the uses for jaguar teeth is decorative jewelry. While Chinese citizens living in Bolivia appear to be at the heart of this spike in jaguar poaching, they are not working alone. They seem to be operating in ‘poaching mafias,’ which involve the coordinated efforts of both Chinese and Bolivian citizens. The Bolivian government has indicated that Chinese companies working in Bolivia are not involved in jaguar killings, although many Bolivian citizens disagree. Insufficient law enforcement is not helping either. There simply are not enough police or forestry officers to protect jaguars, and a number of bizarre occurrences have raised questions about the sincerity of Bolivia’s judicial system. Mongabay’s story details at least two incidents in which compelling evidence that could have been used to prosecute jaguar tooth traders disappeared or were forbidden from use in court. 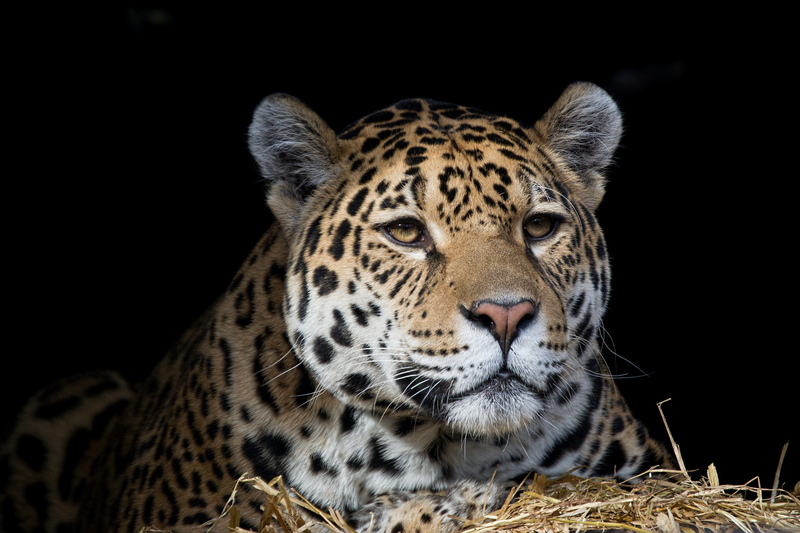 Jaguars have long been persecuted in Bolivia due to their perceived threat to livestock, and the surging demand for their body parts is giving people an even greater motivation to kill them. Mongabay quotes one forestry officer who says local people nearly turned on him when he attempted to seize wild animal parts that were being illegally traded at a fair. The high financial value of such products is making anti-poaching laws difficult to enforce. It is at this point in the post when I would normally say, “But it’s not all bad,” in order to leave readers with a sense of hope. But the situation in Bolivia seems especially dire. Clearly more intense and honest law enforcement is needed, as is public outreach. Both of these initiatives will require resources and funding, which the international community might be able to help with. Gosh. “Poaching mafias?” (How would they like it if I wore their teeth around me neck or on my wrist?) It’s truly sad to see such a beautiful, magnificent species of wild-cat diminishing so steadily. The IUCN Red List merely classifies jaguars as “near threatened.” One would think that with the consistent downward trend in their population numbers over the past 5-20 years or so would serve as some sort of signal to ramp up conservation efforts. Yep, organized crime organizations that focus on illegally trading wild animal parts. It almost doesn’t seem real, but it is. The IUCN Red List isn’t infallible. One of the problems with it is that if there’s one area where a species has a good chance of long-term persistence, its whole global threat status will be positively skewed. Take jaguars, for example. There’s still estimated to be a lot of jaguars left in parts of Amazonia, although most of the Amazon Rainforest is considered to be low-quality habitat for them. So jaguars are classified as Near Threatened across their whole range, despite the fact that many jaguar sub-populations could qualify for endangered or critical endangered status. Thank You for sounding the alarm. It seems awareness which sometimes leads public shaming are our only weapons against multinational corporations. Government leaders are elected to protect the ecosytem and animals (including people) that reside within but they seem to fail worldwide. I’m hoping that sounding the alarm will do some good. Government leaders all around the world seem to be especially good at shirking their duty to protect the environment and vulnerable human communities. Hopefully a little bit of public shaming will at least raise the profile of this issue. We’ve already seen how devastating the traditional Asian medicine trade has been for tigers, there’s no need to let it get that bad for jaguars too.